As the 19th Century wound to a close, Jeremiah C. Lyons had become one of the most prominent real estate developers in the city, owning and managing the J. C. Lyons Building and Operating Company. Many of the firm’s holdings were located along 5th Avenue; however Lyons developed rows of upscale residences in high-end neighborhoods, such as the eight limestone mansions on East 74th Street designed by Buchman & Deisler in 1898, one of which, at No. 55, Eleanor Roosevelt would later occupy. Lyons had earlier commissioned the same architects to design an eye-catching commercial building that was completed that year at No. 495 Broadway—The New Era Building. While Italianate palazzo-inspired buildings were rising along Broadway at the time, Buchman & Deisler stepped out of the box with their design. Drawing on the modern Art Nouveau sub-style popularized by designers and architects like the Scottish Charles Rennie Mackintosh, they produced a no-nonsense behemoth unlike any of its neighbors. The solid-looking structure was originally intended for a printing firm; however it soon became the headquarters for Butler Brothers, one of the first mail-order catalogue companies in the United States. In the 1870’s the three Butler Brothers – Edward, George and Charles – started their business selling wholesale merchandise to retail stores across the country. Expanding to New York in 1880, the firm was selling to about 100,000 customers when it moved into The New Era Building. In the final days of World War I, Butler Brothers made headlines when it refused to accept shipment of German-made toys and china shipped through Holland without notice; even though the goods had been paid for prior to the declaration of war years earlier. The fire had burned for two hours before smoke was detected and an alarm set off. Sections of floors fell through and no fewer than seventy firemen were necessary to fight the blaze. After more than a century since its construction, The New Era Building looks remarkably as it did in 1898 and, as it did then, commands the attention of the most casual passer-by. 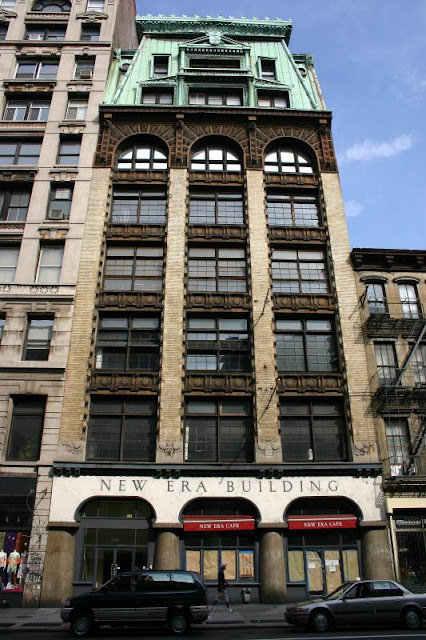 The thick street-level columns, the bold, confident stone arches at the sixth floor, and the outstanding copper mansard make the New Era Building a one-of-a-kind treasure. I think you are confusing two buildings. According to the Landmarks Preservation Commission, the New Era Building is by Alfred Zucker in 1893. 491 Broadway, next door, is the 1897 (or 98?) Buchman & Deisler building. no confusion -- as least not a great deal. Although the LPC cites Zucker as the architect, almost every other source gives credit to Buchman & Deisler for The New Era Building, including the Architectural Institute of America. Why there is a question regarding a substantial building like this as much a mystery. J.C.Lyons was my great grandfather and have pictures of his amazing buildings! I am a relative to one of the owners of the New Era Printing Company. His name was Samuel J. Bederson. He and his nephew owned it together. Yet, in every result I've found after searching, it only shows the Butler Brothers.